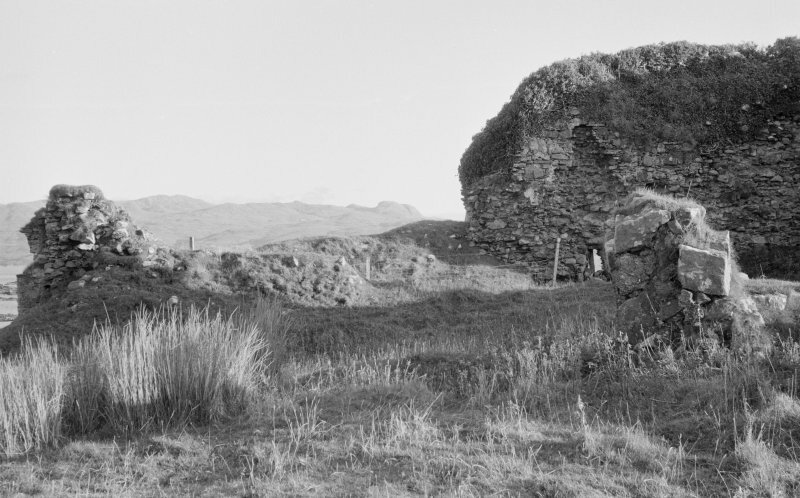 General view of the remains of Knock Castle, Skye. 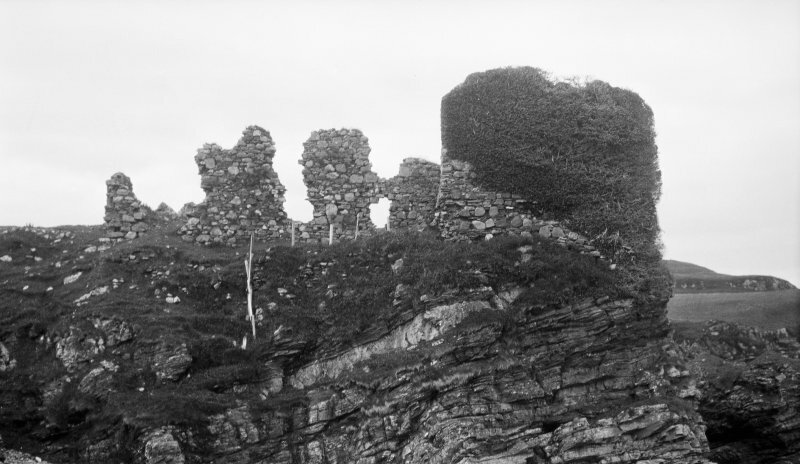 Skye, Sleat, Knock Castle. General view. Skye, Sleat, Knock Castle. Ink plan of Knock castle. 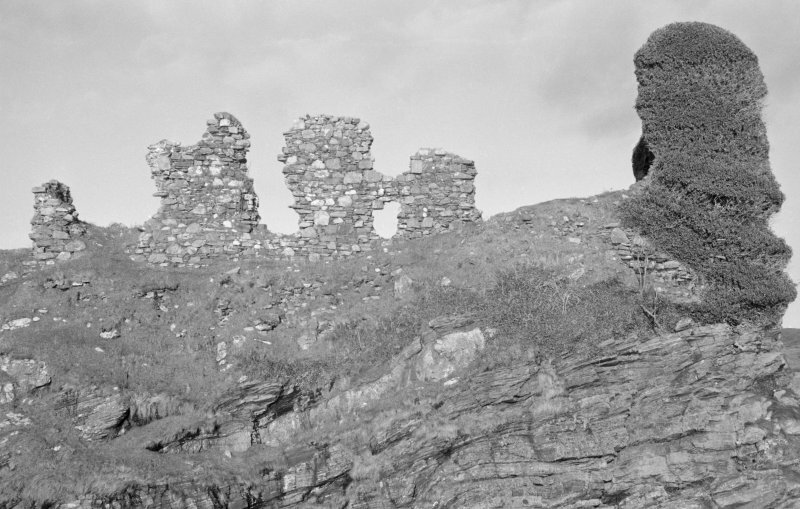 Skye, Sleat, Knock Castle. 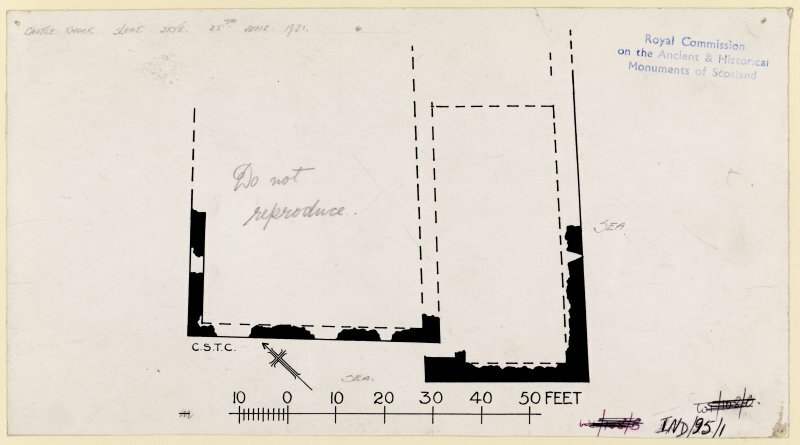 Pencil survey plan of Knock castle. Signed: 'Dr Ross'. 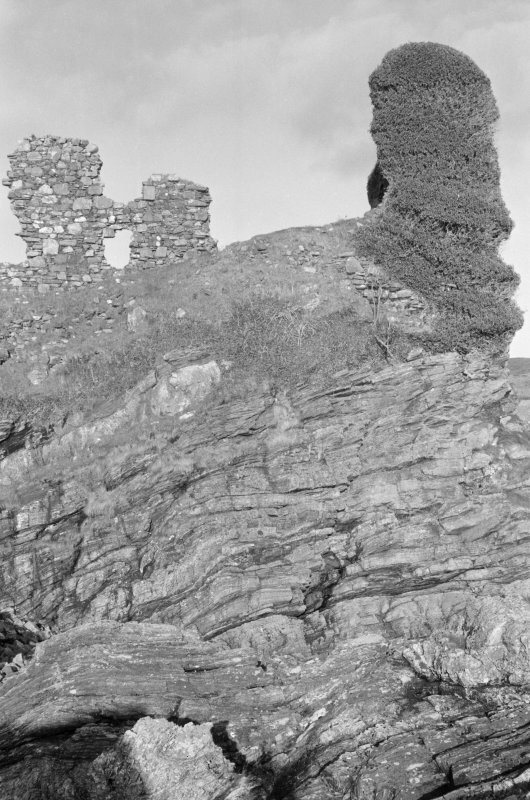 Caisteal Camus (or Caisteal Uaine; also known as Knock Castle from 17th century) Fragments of an early 15th-century rectangular tower, surviving best on the seaward side, with a late 16th/early 17th-century house at right angles. Evidence suggests that an earlier west range enclosed a courtyard. 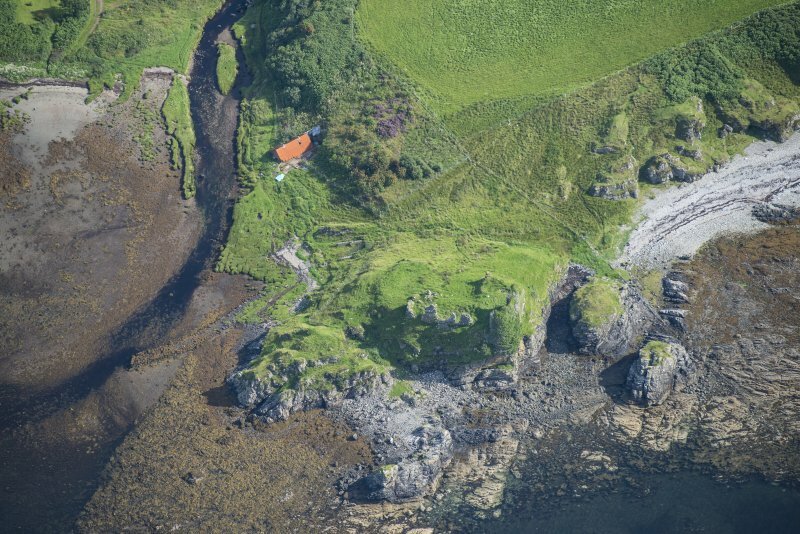 Fused to a rocky knoll on the north-east headland of Knock Bay, with a ditch to its landward side, Caisteal Camus occupies the site of an Iron Age fort, Dun Thoravaig, with sweeping views out over the Sound of Sleat. Knock Castle ... is easily approached from the landward and, so far as can be seen, has comprised a main block with a (later?) range of building projecting at right angles, probably forming sides of a courtyard. The main walling, averaging 4ft 3ins in thickness, forms the most southerly angle on plan and stands to a height of over 30ft. Built of rough rubble the interior face is much decayed and broken away, and the only opening discernible is a small window at present ground level in the SE. wall. Traces of foundations show these walls to have enclosed an area of about 55ft by 26ft wide. An entrance 3ft 2ins wide, in the SW angle of the building, probably dates from the later addition, which is 49ft long and has contained two storeys. Very little can be followed without excavation, but the buildings appear to date from the 16th century. This is the place known of old as Castle Camuys or Camys. Monro thus spears of it as 'the Castill of Camus in Sleit, pertaining to Donald Gromsone'. 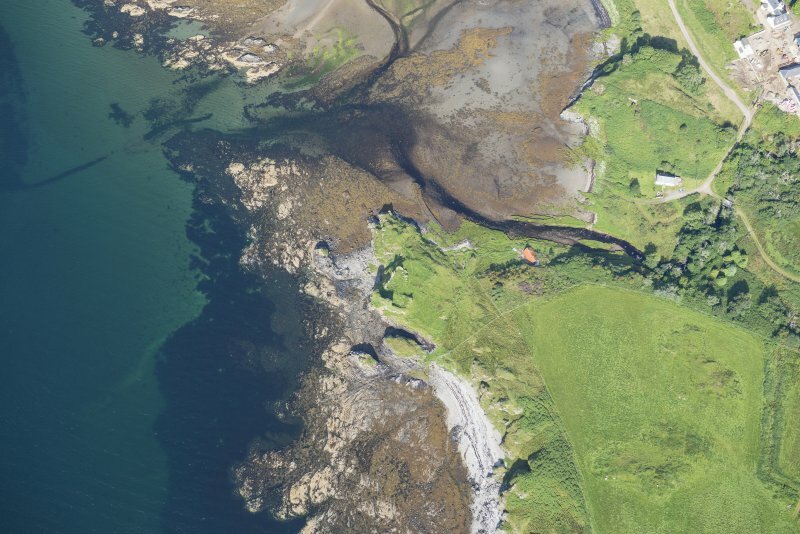 In 1614 there is a confirmation of lands to Donald Gorm of Sleat ('Slait') with the proviso that 'the castle of Camus' should always be open to the King, his lieutenants, chamberlains, etc (Information from Reg Magni Sig Reg Scot, No. 1087). The last documentary evidence of life in the Castle is on 31st August 1632, when McConnillreich signed a bond there declaring Sir Donald MacDonald to be his Chief. 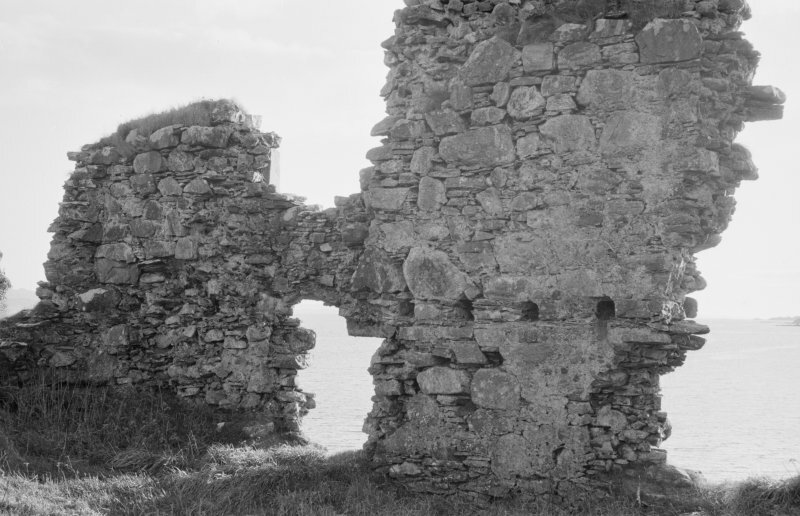 The actual date when the Castle ceased to be a residence or Clan stronghold has not been traced, but no doubt, the walls of the building provided material from which the house of Knock was built, and we find that quite a number of Estate documents were signed at Knock during the early years of the 18th century. 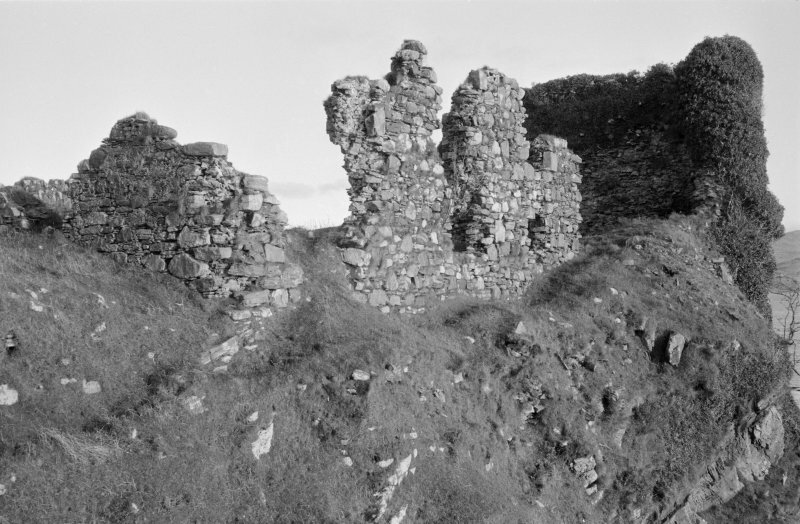 The site of Dun Horavaig is now occupied by the ruins of Knock Castle, all traces of the dun having been obliterated. 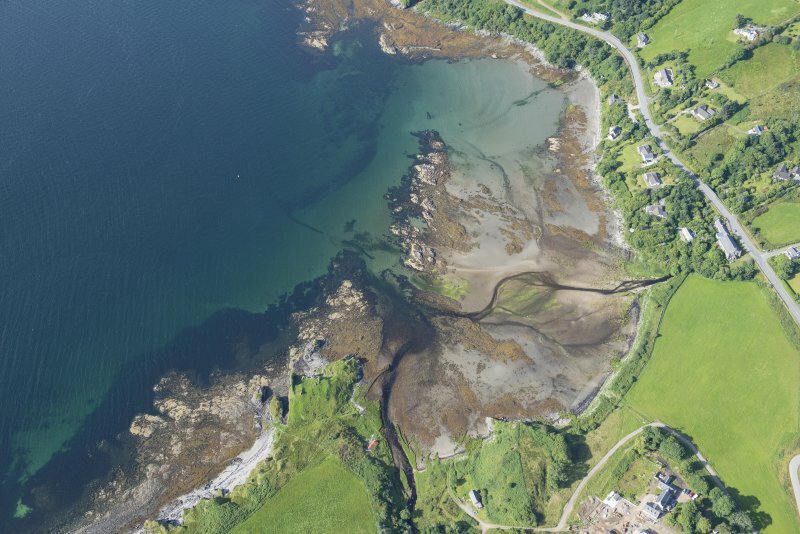 It is also known locally as Dun-Iain-Choinnich. 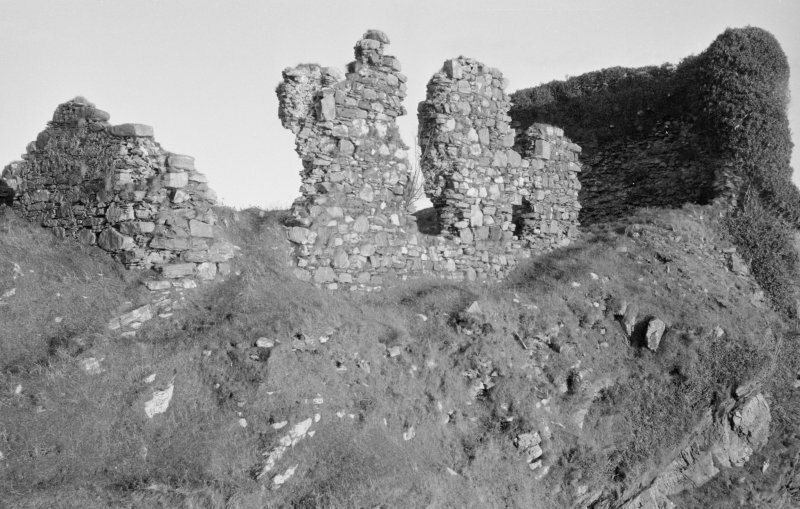 Knock Castle described by RCAHMS. In poor condition. Further remains of turf-covered foundations indicate a range of buildings enclosing the courtyard on the NW side nearly parallel with the main block. There are also traces of a long narrow building at a lower level at the NE end of the main block. The head of the gully on the SW side of the Castle has been skirted by a stone wall, of which turf covered foundations remain. Visited by OS (A S P) 17 June 1961. Nock, Sleat Parish. (Probably 'Knock' Western Isles). In the National library of Scotland, Vol. 11, No. 3 of Water Colour Sketches by Thomas Brown, Advocate, is a view of this Castle ruin. Reference "Adv.MSS.34.8.1-3"
See under "Water Colour Sketches, Series of, by Thomas Brown, Advocate". Repair of the House of Knock. Note of sums spent 1801-1802 and 1813-1814. Abstract of Entailed Improvements. Certified by James Gillespie. Mason work undertaken at the House of Knock. Note of cost included in an account for Armadale and other work in Sleat. Payments for repair of the house of Knock.Payments made to (Thomas) Thorburn for the work. Account between Rt. Hon. Lord Macdonald and John Campbell W.S His Agent and Cashier. 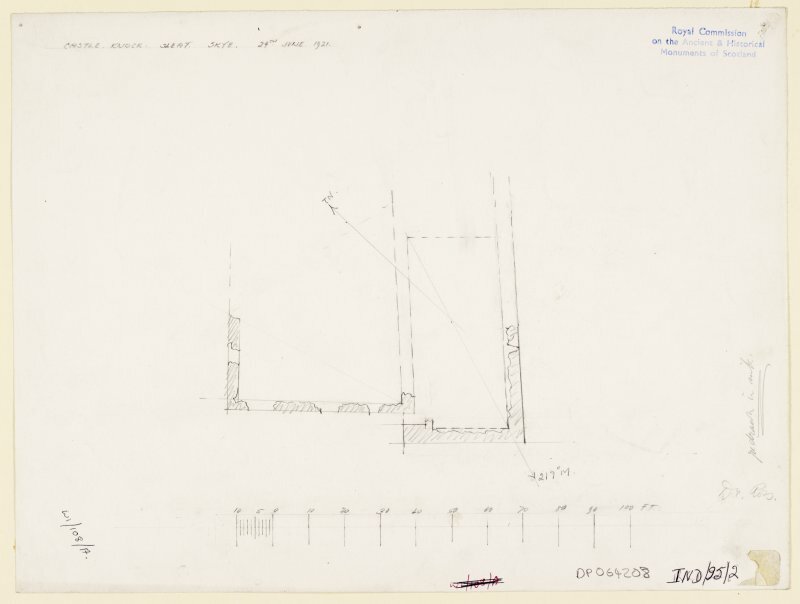 Report on the repair work done at the House of Knock by (Thomas Thorburn) after its inspection by James Gillespie, Architect, and Thomas Hall, joiner. 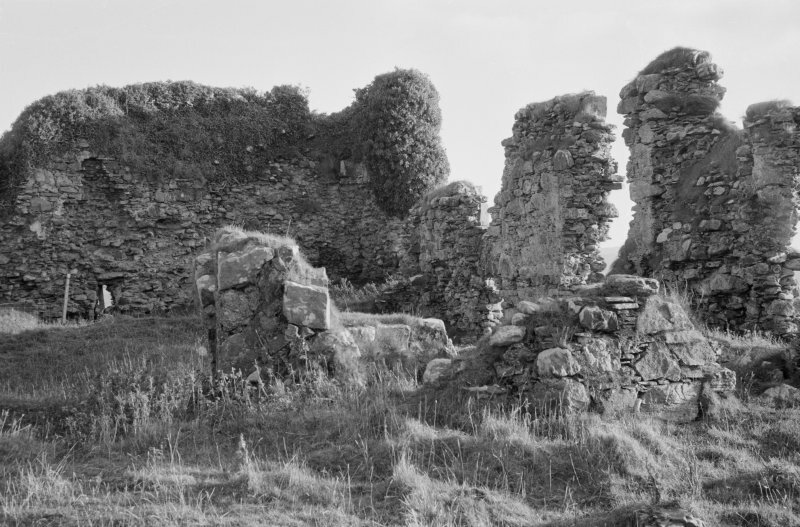 Photographic survey of Knock Castle, Skye, by the Scottish National Buildings Record in November 1964. 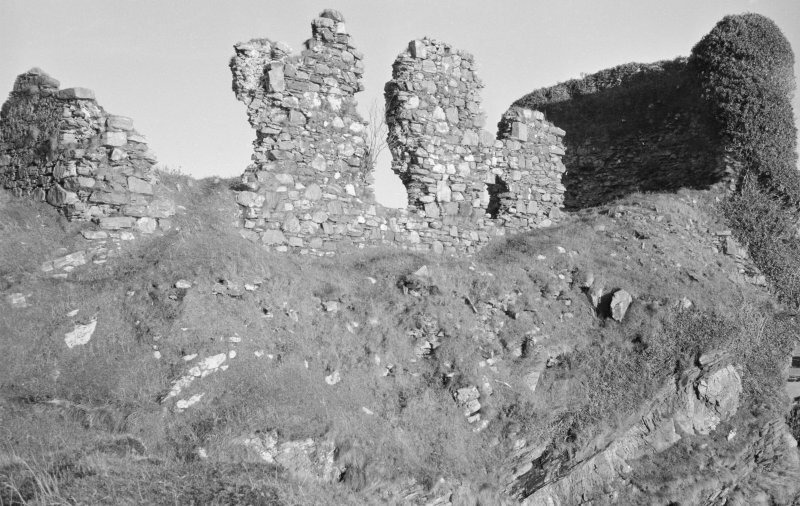 This castle, a residence of the MacDonalds of SIeat, stands on a low knoll, protected by crags on the south and west sides, but is approached without much difficulty from the north. 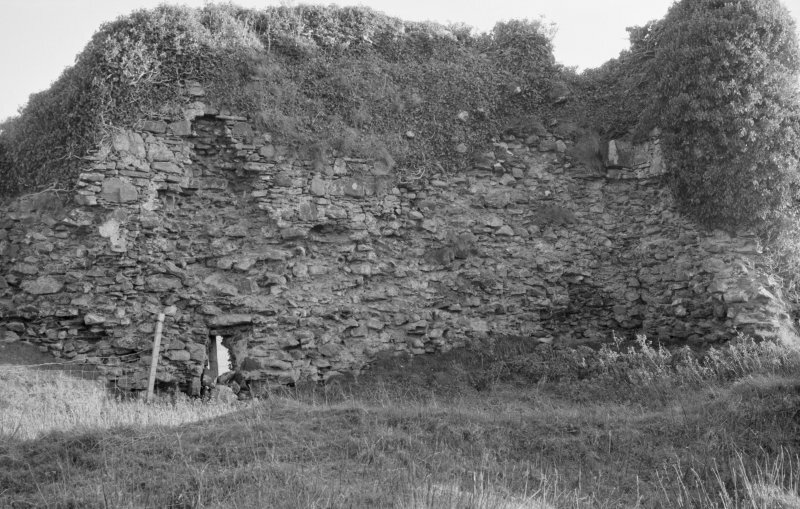 The west wall and parts of the south wall stand to a height of at least two storeys but the remainder of the walls are mostly ruinous and turf covered. 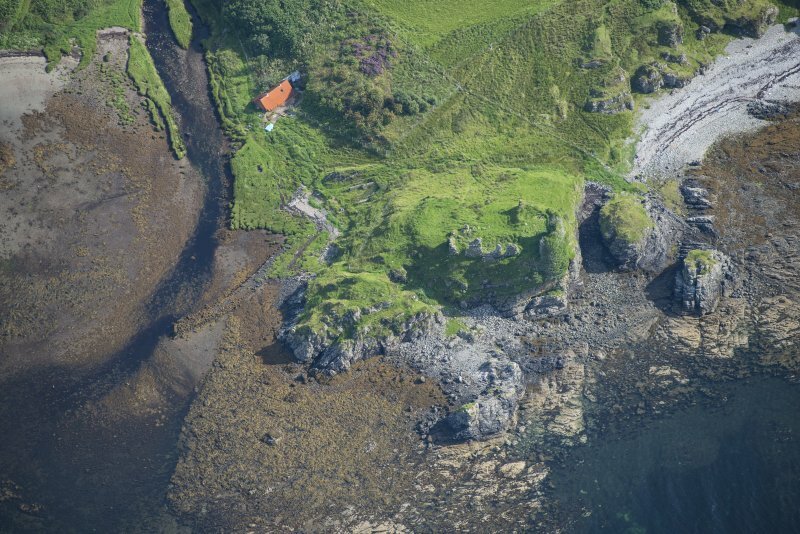 The site is of architectural interest, however, as it may be the only example of a 'hall-house' to be seen in Skye and the Outer Hebrides. 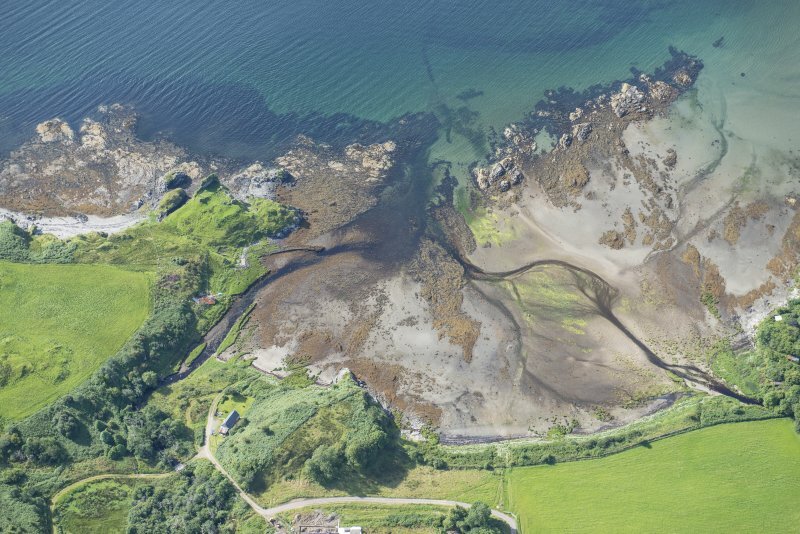 NG 67140 08710 (Canmore ID: 11544) The Scottish Medieval Castles and Chapels C14 Project (SMCCCP) is a nationwide buildings archaeology project investigating the archaeological potential of building materials surviving within upstanding medieval structures. 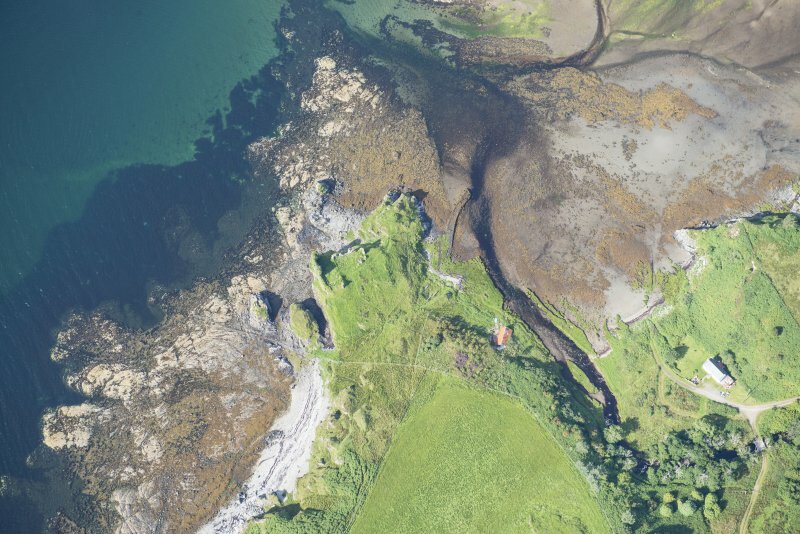 The SMCCCP combines the survey and analysis of medieval buildings and environments, with the analysis and radiocarbon dating of surviving building materials. 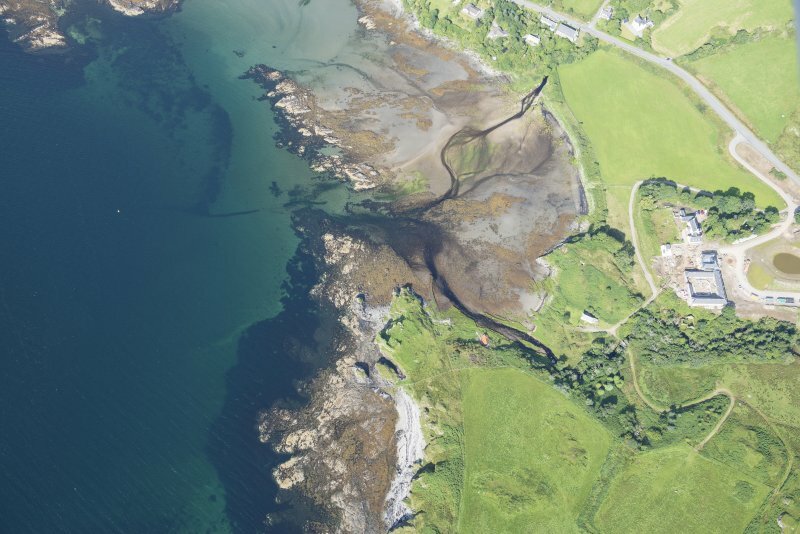 The project seeks to constrain building chronologies, and investigate the technical conversion and palaeoenvironmental potential of source materials. The upstanding masonry of Castle Camus was surveyed and a number of mortar and environmental materials recorded and sampled in 2015. These materials are undergoing further analysis and, where appropriate, will be AMS radiocarbon dated.